The greatest show on earth is coming to your house! 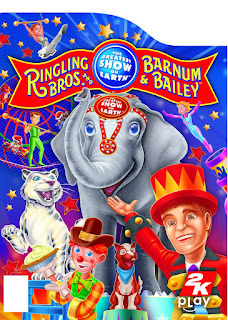 2K Play and Feld Entertainment proudly announce that Ringling Bros. and Barnum & Bailey, the ultimate circus experience for Wii, is now available at retailers across North America. This holiday season, your family can clown around, preform hair raising stunts, and much more under the big top in your own home! My kids were so excited to review this Wii game. We are a family of gamers, so we all enjoyed trying this one out. Plus, the circus fun has come to Nintendo DS too! Ringling Bros. and Barnum & Bailey: Circus Friends Asian Elephants for Nintendo DS, gives pachyderm enthusiasts the ability to care for their very own Asian elephant. Gamers must ensure their playful pal eats well, stays clean and healthy, and gets daily exercise. Once the proper training program has been implemented, their circus friend can star and show off in The Greatest Show on Earth™! This game had the whole family for hours the first time we put it in. There is so much to do, it offers something for everyone. I think it is one of the best family friendly games I've ever seen. The kids especially loved it and it is now their first choice when playing the Wii. I highly suggest this game for families with kids both small and bigger. The games would appeal to little ones as well as grown ups. We love it! As for the DS game, I wish I could offer my thoughts. But, my daughter has refused to let anyone else play it since it arrived. She has spent countless hours taking care of her elephant. I'm guessing if she's that involved and unwilling to share, it must be a hit with her! 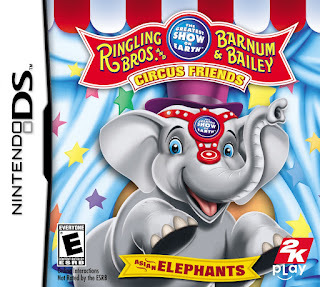 Ringling Bros. and Barnum & Bailey for Wii is available for $39.99 and Ringling Bros. and Barnum & Bailey: Circus Friends Asian Elephants for Nintendo DS is available for $29.99 at major retailers across North America. They are rated E for Everyone. 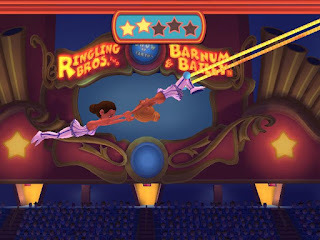 For additional information about the Ringling Bros. and Barnum & Bailey games, visit www.Ringlingbrosgame.com or to view a complete Ringling Bros. tour schedule, visit www.Ringling.com. Awww this reminds me of Circus Atari back in the day...I might have to check it out!